BY PAUL F. STAHLS JR.
It’s the surrounding sea and its 280 species of neighborhood fish that keep Grand Isle’s residents staying and visitors coming back — especially in summer when the 90-year-old Grand Isle Tarpon Rodeo and a half-dozen younger tournaments turn the old barrier island into a nonstop party town. These days, however, even the fishermen are stopping to enjoy the other natural assets to be found here, like the nesting grounds on the island’s south shore and the islets of 180-square-mile Barataria Bay, the wild sounds and scenery of adjacent wildlife management areas and the unimaginable swarms of birds and butterflies that arrive in spring and fall (celebrated by the island’s now famous three-day Migratory Bird Festival in April). Capt. Danny Wray, a respected fishing guide who has broadened his services to include nature, ecology, history and photography tours (225-721-8182), asserts that boating tours around Grand Isle and Barataria are more stunning than nature tours he’s seen in celebrated spots like the Virgin Islands and Hawaii. And the history? Don’t get him started…unless you’d like to hear about the mix of early settlers (like indentured servants escaped from European ships), World War II submarines, Lafitte’s pirates and old Fort Livingston on Grand Terre, just across Barataria Pass from Grand Isle State Park (easy access by fishing boat but check weather and wave reports before trying it by kayak). For terra firma tours featuring sites and stories from the early 20th century, ask owner Leoda Bladsacker at Yum’s Café (985-787-2995, 3059 LA. 1) about her golf cart tours of the historic district at the island’s center. To find several short but rewarding nature trails (plus motel and restaurant lists), stop first for an essential Island Map at the Grand Isle Tourism Office (2757 LA. 1, 985-787-2997, grand-isle.com) next door to a flower-filled butterfly dome. The big map’s “birding tract” trails for bird and butterfly photography also present samplings of the island’s variety prairie, marsh and forest terrains), all accessible as properties of the Nature Conservancy (985-688-3871, nature.org /Louisiana). The Lafitte Woods Trail through the Griletta Tract, for instance, leads for a time though windblown inland-leaning oaks (reminiscent of the 1920s photographs of Fonville Winans), then transforms itself into long-grass footpaths as they pass near the north shore’s full-fledged marsh. The well-preserved natural aspects of Grand Isle owe much to the Conservancy and its community service projects, such as assisting Grand Isle School with its Native Plant Nursery, and local director Jean Landry says the town responds with total support for projects like the drive to replace storm-ravaged palm trees. From the Griletta’s north side it’s one block west on Medical Avenue to an unexpected attraction, a strikingly designed town park that doubles as a water purification facility. Located at 90 degrees west longitude, “Ninety West Park” centers on a circular “rain garden” surrounded by porous surfaces that filter contaminants from the run-off of heavy rain events. Just north of the park, beside the island’s kayak launch, the Marine Fisheries Lab has become a premier attraction thanks to tours featuring some of its astounding projects (often partnering with the LSU Extension Service), like the production of “customized” oysters in varying sizes and flavors. We’re talking about fat and flavorful oysters 12 months a year. Walk-ins are welcome but call the lab in advance (985-787-2163) to be sure a biologist is available to guide you. At the east end of the island, Grand Isle State Park offers a mile of beaches plus fishing piers, nature trails and camping (985-787-2559, crt.state.la.us, click “State Parks” and “Grand Isle”). Undaunted by the natural and manmade catastrophes that barrage it periodically — whether rolling up its sleeves to reinforce its coast or acting as staging ground for oil-spill mitigation projects — Grand Isle remains much the same as always. Twelve hundred residents still consider the place a paradise, with visitors still visiting, crab pots boiling, songbirds singing, butterflies flying, fish still biting. That’s how you’ll find it next time down, and hopefully forever. So you want to fish, too? There are marinas for launching your boat, or check grand-isle.com for a list of 30 charter captains. If you prefer staying ashore you’ll find that every street, lane and trail leads to fishing opportunities,and gear and bait shops are everywhere. There’s beach fishing along the eight miles of Gulfside sand, or try wading for flounders and crab-netting from the jetties. 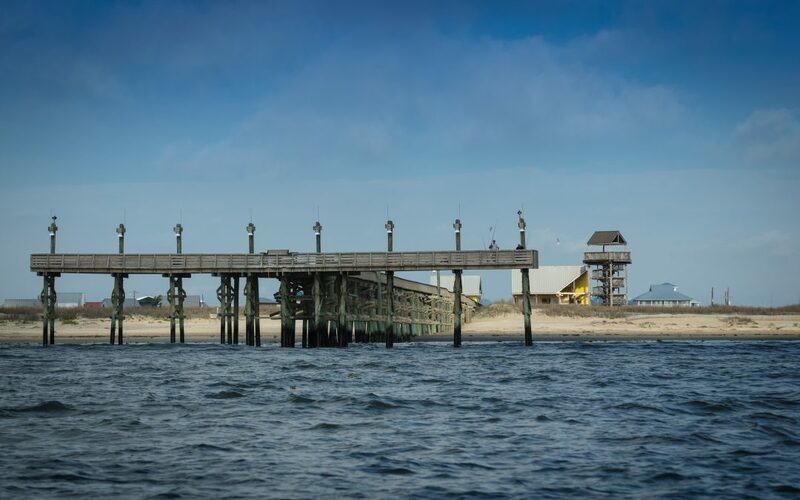 Remember also that “offshore” here can begin with a five-minute kayak ride and, matter of fact, hard-fighting deep-water species can even be snagged from the La.1 “Old Fishing Bridge” or public piers, like the handicapped-accessible pier on the bay side and 400-footer in the State Park. The camps along LA. 1 are private property, but public beach access is provided by 20 well-marked crossover points. As a setting Grand Isle has produced three works of great American fiction. Alas, the famed Lafcadio Hearn‘s 1889 “Chita” is not one of them (its focus is 40 miles west and based on the 1856 Last Island Storm), but the opening scenes of steaming west from New Orleans give us an almost poetic description of “beautiful Grande Isle” with its orange trees and flowering meadows. The “rustic hotels” and cottages he saw then would survive to give Kate Chopin a stage for her acclaimed 1889 story of desire and despair, “The Awakening,” still in print and filmed as “The End of August” in 1982 and for TV as “Grand Isle” in 1991. James K. Feibleman was a Tulane philosophy professor and novelist whose 1948 “The Long Habit of Living” was a gripping philosophical (of course) story of murder, family bonds and revenge on the island community that he renamed Isle Cheniere in Hamilton” Parish. Ten years later his wife, Pulitzer winner Shirley Ann Grau, moved her island farther from shore for “The Hard Blue Sky” and named it Isle aux Chiens, where its remote community faced constant conflict, both human and natural.